Mabel Emmanuel and Steven Ekhiator began a romance in a most unlikely place – detention camp for African migrants in Libya. Theirs is a story of hope amidst the chaos. It all started when Mabel asked to use Steven’s mobile phone to call her mother. She needed to urgently get money. Upon hearing from a tearful Mabel that her mother could not send the money, he paid off her debts. Skip forward a good few months and Mabel gave birth to the couple’s son, David, in the detention camp. 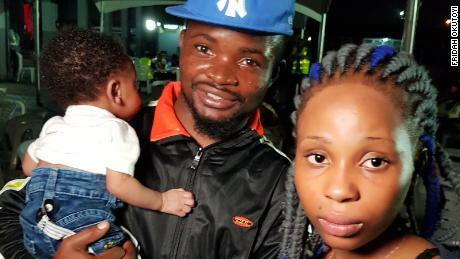 Mabel Emmanuel and Steven EkhiatorThe couple are among 401 Nigerians who returned home on two government-sponsored flights, overnight, on 5 December. Speaking with the BBC News Pidgin shortly after they arrived Nigeria on 5 December, she said she was happy to be back home and looking towards a bright future raising her son with her partner. “Libya is a terrible country, I won’t advise anyone to think about the place, or talk about going,” Steven added. In the last ten months, over 4,000 citizens have been repatriated to Nigeria from Libya. Many West Africans risk their lives on flimsy boats, trekking through the Sahara to get to Europe in search of greener pastures. It’s a journey that neither Steven nor Mabel ever sees themselves embarking on again. But Steven now has no regrets because he met Mabel. “You can’t determine your wife-to-be, where you can find her, it can just happen suddenly,” he says.